I was reminded about the influence of perspective after the USDA’s Economic Research Service released their 2014 net farm income forecast at the recent USDA Agricultural Outlook Forum. It projected a decline from 27% from 2013. Such a sizable percentage decrease caught people’s attention and a series of popular and farm press article followed, many alluding to the potential for a dramatic reduction in crop prices and potentially farmland values. While many have focused on the magnitude of the decline, I think it is worthwhile to keep in mind that when viewed in the context of history, the farm income forecast remains quite high. 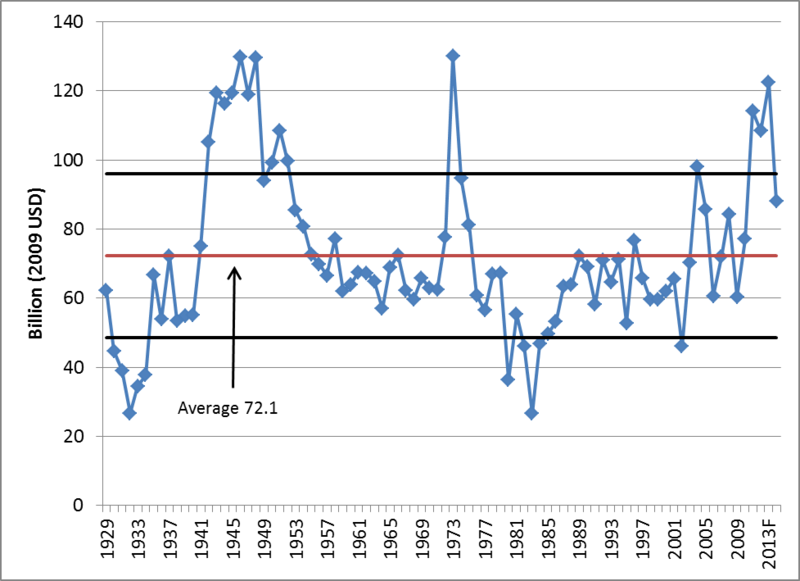 The chart below shows net farm income adjusted for inflation (2009 dollars) from 1929 to 2014. The red line on the chart shows the average over this time period is 72.1 billion 2009 dollars. The two black lines represent one standard deviation above and below the average. Figure 1. Real Net Farm Income (2009 USD), U.S. 1929-2014f. This chart helps to put in perspective the very high levels of income that the agricultural sector has enjoyed in recent times. In fact, net income has only been above $100 billion (in 2009 dollars) for two significant periods of time, right after World War II and the recent period. On the downside net farm income has only fallen below $50 billion (in 2009 dollars) for two periods, the Great Depression and the farm financial crisis of the early 1980’s. Readers can find a detailed discussion of the boom-bust cycles in agriculture in an article that I wrote with Jason Henderson and Michael Boehlje. While I don’t want to go into all of the details of that study, we concluded that farm income collapses (busts) generally coincide with a collapse of demand for agricultural commodities and are exacerbated by too much financial leverage in the farm sector. Additionally, turmoil in the broader economy, substantial and rapid changes in interest rates and inflation can also contribute to instability in agricultural asset markets. So where would such a collapse come from in our current situation? Today, the focus should be on demand created by the development of biofuel markets and emerging economies, particularly China. Likewise, rapid and large increases in interest rates (300+ basis point increases over a couple of years) and/or broad turmoil in the broader economy would potentially destabilize the farm sector. At this point is does it does not appear that these scenarios are likely, but one should carefully watch these factors. So what does all this mean? It seems clear that the very high levels of farm income experienced in recent years (the last 7 to 10) may be receding. Not surprisingly, recent results from Iowa, Illinois, Indiana, and the Chicago Federal Reserve farm land value surveys suggest that the farmland market is slowing and in some cases showing declines. This trend will likely continue if farm incomes moderate. I would expect that the very high “record setting” sales will likely become more and more of the exception to the rule. Unless something dramatic occurs, it seems unlikely that demand would completely collapse and farm income would fall enough to put us even into the bottom half of the historical range for farm income. Until that changes, look for most reports of farmland values to moderate and perhaps show slight declines. We might also expect to see activity in the farmland market to slow and perhaps more potential sales move to private listings as opposed to auctions. This is not to say that such events won’t happen, the future is unpredictable. Now for the words of caution. It does seem apparent that farmland purchased at or near record highs may see significant declines in value. Some purchases were almost certainly made at prices that cannot be economically justified. For some of these buyers a collapse in value might be the appropriate word. In fact, I often say that one easy way to turn $16,000 into $9,000 is to buy an acre of 200 bushel per acre farmland with no development potential for $16,000, but this is hardly the majority of the market transactions. Much like the period when prices were rapidly increasing, buyers should carefully assess the long-run fundamentals for crop costs and returns when considering farmland investments. At present the return opportunities still remain historically strong, albeit not exceptional. At times it is easy to be caught up in the emotion of rapidly rising or declining prices but remember, farmland is a long-term investment and a long-term perspective on returns is required to evaluate its attractiveness. Henderson, J., B.A. Gloy, M.D. Boehlje. “Agriculture’s Boom-Bust Cycles: Is This Time Different?” The Economic Review, Kansas City Federal Reserve Bank, 96:4(2011):83-101.